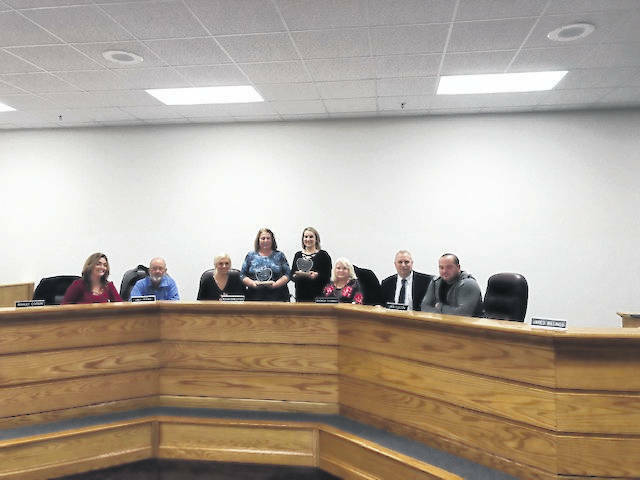 Mason County Schools celebrated the 2018 Teacher and Service Personnel of the Year at the recent Mason County Board of Education meeting. Kristin Wallbrown, Beale Elementary teacher, and Jackie Corfee, Leon Elementary service personnel, received the awards. Pictured with Wallbrown and Corfee are, from left to right, Board Members Ashley Cossin, Dale Shobe, Board Vice President Meagan Bonecutter, Board Member Rhonda Tennant, Superintendent Jack Cullen, and Board President Jared Billings.